We all know foreclosed homes are usually available at a huge discount, which makes them quite appealing to purchase. But, there are some important things to think about before you do. Be prepared to be hit with some very costly mistakes if you don’t heed this advice. So let’s begin with with some Foreclosure 101 education. 1. 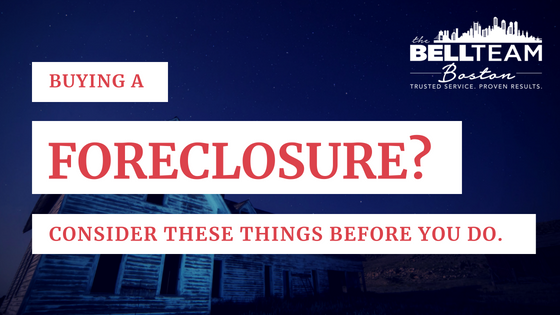 What is a foreclosed property? A foreclosed home is one that’s auctioned by the bank in hopes to recover some (or all) of the mortgage loan(s) that the homebuyer defaulted on. Sometimes banks try to sell quickly and they’ll offer incentives to potential buyers, but beware of these activities to lure you in. There’s much more to think about first. For example, how is a foreclosed property different from the normal resale of a home? Negotiating isn’t really a standard practice during the process of buying a foreclosure. The bank will require a pre-approval letter before considering a loan. The home will come “as is” so the condition of the home, (livable or not), becomes your sole responsibility. We strongly suggest not settling for just any foreclosure. The price might be super attractive, but you can check for available properties that meet your needs in various places: usually as sale notices in the local newspapers, property websites, and through a trusted realtor. No matter what, definitely look into the public records of the home you’re considering purchasing too. Seriously, this is where a real estate agent will shine as your real estate expert and you will receive incredible value from his/her expertise. Not only do they know the local area, they’re also knowledgeable about the complexities of the foreclosure market. Your realtor may even be able to help you get a better deal. We highly recommend not going through the foreclosure purchase alone because you could end up trapped. Your realtor will have studied the market and can provide you with a true assessment of the real market value of the property. Think about consulting a real estate attorney as well. This way you’ll thoroughly understand the laws surrounding your intended home purchase. It’s a shame, but all too often people stop maintaining a house when they’re about to have it taken away from them. It’s important that you thoroughly examine the condition of the home to avoid ending up in a bad deal. Being negligent when it comes to inspecting the home on your own can easily increase your costs due to a lot of repairs and maintenance you may not have prepared to have. If you’re serious about buying the house, you may also want to consider getting a professional home inspection beforehand. What is the bank owned addendum? It’s a legal document attached to all bank owned properties. Essentially, it’s a contract applied to all buy/sale agreements with conditions that are generally non-negotiable. Being apprised of the conditions to circumvent any possible future legal issues is strongly suggested, especially if you don’t consult a real estate attorney. Read through it carefully before signing it. Your real estate well being is important to us here at The Bell Team Boston, so if you’re considering buying a foreclosure we want you to be diligent in your evaluation of the advantages, disadvantages, budget, etc. We’re here to help ensure your real estate purchases make the most sense for you, and will be profitable in the future. There’s no room for regret, so give us a call now to help you buy your new home… foreclosure or not—(781) 559-0071.